Be Basket Ready for your Bunnies! Everybunny is so excited, the warm weather finally here. Spring is in the air and in our step. Time to hop up and get out and visit friends and family. Why show up empty-handed or with nothing special when you can “wow’ them? 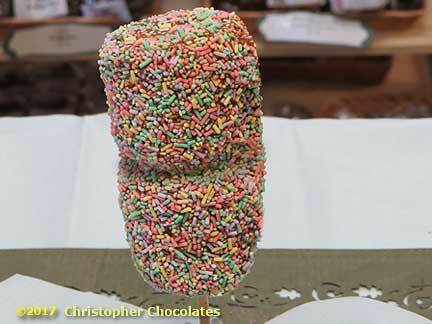 Christopher Chocolate has vast assortments of Holiday themed candies and chocolates. We have everything you can possibly imagine to impress. 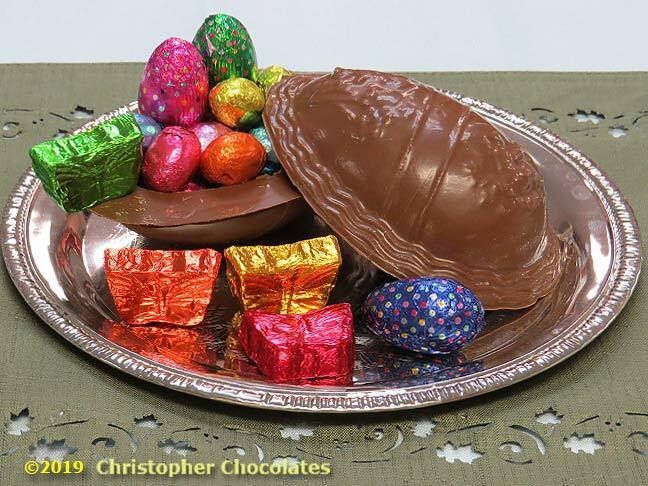 Let's just begin with a large selection of chocolate hollow and solid bunnies sized for every situation (up to 3lbs!). But that's just the begining, a whopping variety of Filled chocolate eggs and jelly beans and Peeps and Dipped< Peeps and themed gummies and more. We also have Baskets and Grass ready to go and even numerous prepared baskets to enhance anywhere you wish to entertain. Christopher - Making Easter Special for Generations. Christopher Easter Holiday Products are all great. Among many of them our Local Candy Shop among other providers makes a difference you can taste. We work extra hard to make sure you can get true world class quality chocolate. 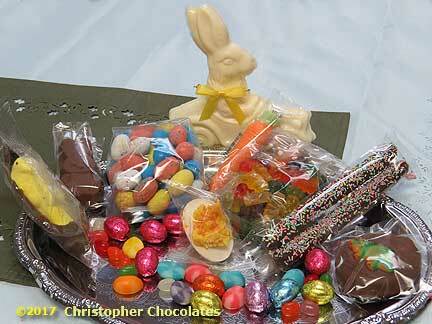 Christopher has a grand assortment of Easter themed and colored treats that will make your Holiday come to life! We got BUNNIES! All sizes and in white, dark and milk - Solid and Hollow. Hurry in though because as much as our great bunnies have multiplied, people really love them this time of year and they find homes fast! We are where EveryBunny goes when they need to bring the BEST Holiday gift basket. Foods they will savor (as in, “intensely”) and designs that delight. Hop on over! Yes, the taste will blow you away. 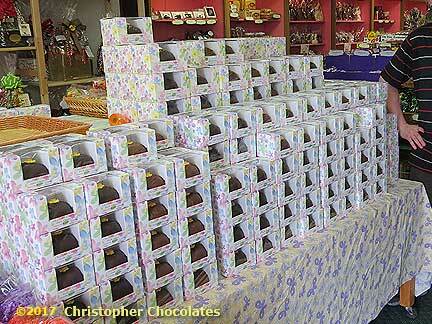 Take a Chrispy Treat, dip in world-class fine chocolate, adhere the Easter "Badge of Honor" and Sprinkle. A magical treat sure to delight candly lovers anywhere.Hop on over! Oh! 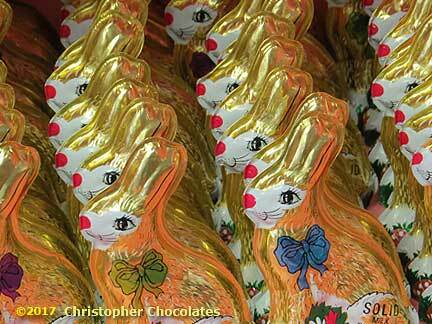 And did we mention the Easter Bunnies? These things are going crazy! First we had a couple of Holiday Bunnies show up (maybe late March?) Now they're all over the place! Every Shape (ok, they're all rabbit-like) size (from .2oz to 3 huge pounds) and in White Chocolate, Dark Chocolate and Milk Chocolate. some solid, some hollow, whichever you prefer. A very seasonal product, Remember these are Rabbits so they move FAST! Delightful Hollow Split Shells- The beauty of this one is how it keeps giving! Full of surprises they are. Available in Milk, Dark and White Chocolate the openable chocolate egg shell let's you fill it with other delights. Great place to hide jelly beans, foil treats or even place a small toy inside (please make sure people know not to eat the toy!). Now THAT is a snack! 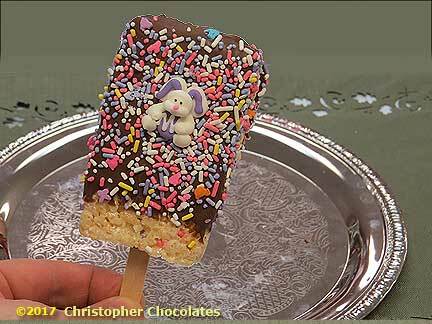 Welcome to Christopher's Easter Double Whammy Marshmallow Pop! (All dressed up) We start with (a stick actually) but THEN, a, no wait, TWO Giant Marshmallows, dip Those in our House Fine Chocolate (Milk or Dark Recipes) and finish off with Sprinkles (and mmmmmm). That's a whole lotta love right there. Certain to impress anyone lucky enough to enjoy one. Hop on over! And this is how they returned! 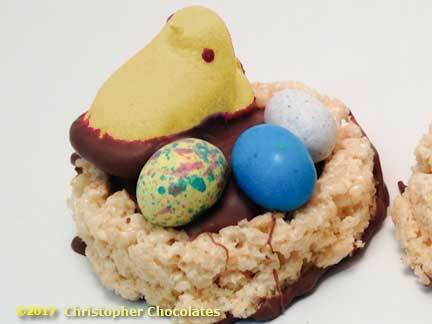 Fresh seasonal Marshmallow Peeps dipped into their Canoe to make a special seasonal splash! Can you name a better seasonal candy specialty? 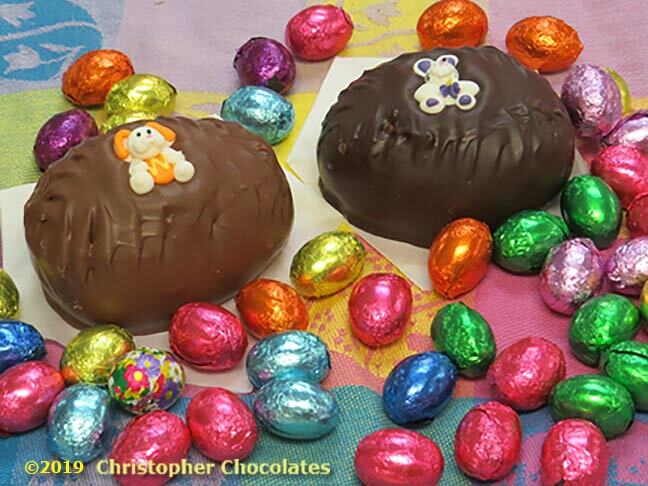 We know that Chocolate Bunny’s hold a special place for us during Easter but what is more tempting and satisfying then that timeless combination of fine Christopher Chocolate enrobed Easter Egg Creme’s? Available in a variety of sizes and flavors to suit anyones taste. I found an Easter Egg! 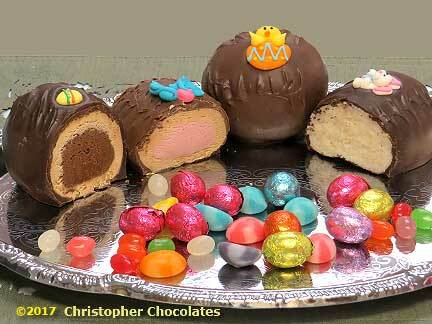 We sell 8 flavors of cream filled Easter Eggs in milk and dark chocolate. Come on in and treat yourself (and maybe share some with someone else) the areas best Chocolate Cream Eggs brought to you direct from our Local Family Shop to yours. Featuring a variety of flavors and sizes from 1/2lb to 2lbs. *Please do come by as soon as you can, these are seasonal and supply is limited. Hop on over! 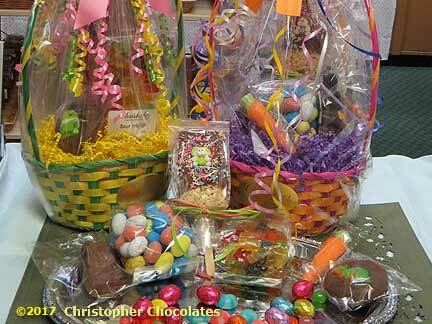 Make Easter this year Extra Special with Seasonal, Local and Specialty Holiday Candies and Baskets. Our Premium Filled Fancy Chocolate Easter Eggs! 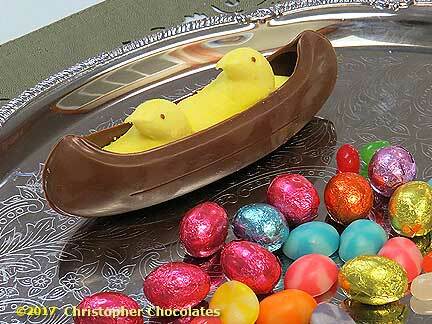 2 Marshmallow Peeps paddling away in a delectable chocolate canoe. 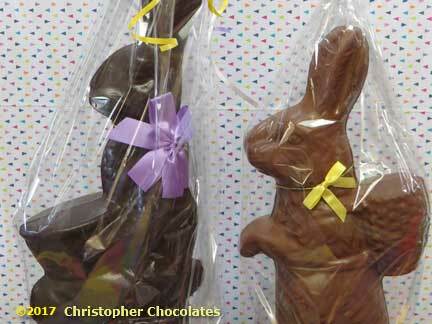 Christopher Chocolates has all of your seasonal favorites.